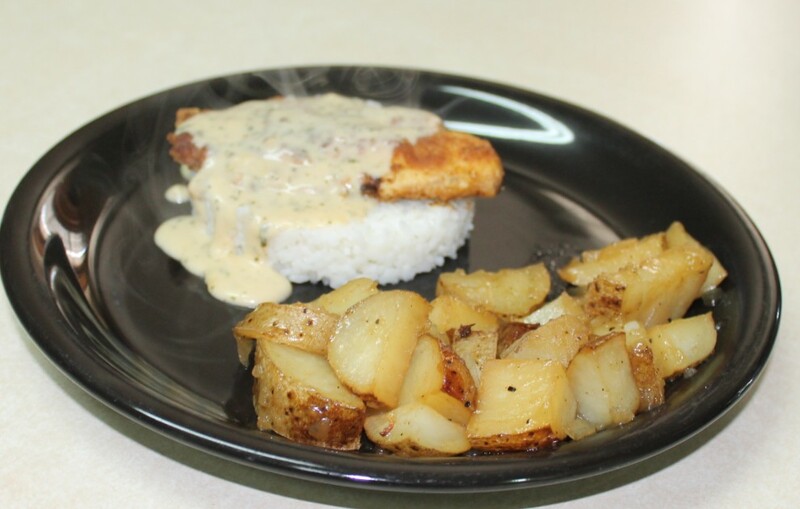 Chicken-Fried Fish With Rice — MumbleBee Inc MumbleBee Inc. Meanwhile, sprinkle the fish all over with 1/2 teaspoon salt, and pepper to taste. Combine the flour and paprika in a shallow dish. Beat the eggs in another dish. Dip each fish fillet in the eggs, then dredge in the flour mixture, turning to coat. Reserve the flour mixture. Heat 3 tablespoons olive oil in a skillet over medium-high heat. Working in batches, fry the fish until cooked through, 3 to 4 minutes per side for a nice golden brown. Transfer to a plate and tent with foil. Wipe out the skillet when finished with fish. Heat the remaining 1 tablespoon olive oil in the skillet over medium-high heat. Whisk in 3 tablespoons of the reserved flour mixture, then add the chicken broth and 1/4 cup water; bring to a boil, whisking. Add the milk, cream cheese and parsley; cook, whisking, until slightly thickened, about 2 minutes. Season with salt and pepper. Heat up the required water in a pan for your minute rice and cook as directed. Divide the rice and fish among plates and top with the sauce and sprinkle with paprika. Serve with the fresh green beans, asparagus, or potatoes. This is a great recipe for someone who loves fish and for those who may not. For those who do not like this I promise you would forget you were eating fish! Don’t believe me give it a try and let me know how it turns out. thank you for posting the recipe for Chicken-Fried Fish With Rice. I love the healthier alternative of using fish! I can’t wait to try this. Thank you for the recipe! We have lots of grouper here my nephews caught, think it would work ok with that? This sounds so good! hi, this looks like a great recipe for our family…right now, us Catholics are in the middle of Lent and we usually have a fish dinner on fridays. kudos! I have never seen anything like this before. It looks delicious! I can’t wait to make it. Yum!! This sounds fantastic!! We are lovers of friday fish fries in Wisconsin so I will have to try this for our next friday get together!! Thank you for this recipe! Looks terrific! I love Tilapia!! The pic looks good – down to the potato side!! This recipe was definitely pin worthy!! I am not sure about the paprika though. Doesn’t it make the fish spicy?